More Gravel Bars Than Before! Nice looking day today. Temperatures in the low 90s, a little overcast with a slight chance of showers this afternoon (20%). Forecast is still calling for temperatures in the upper 80s to low 90s through Friday with chances of showers each day. Weekend looks dry so far. Unless we get hit with a lot of rain, I am going to stop giving a blow by blow on the lake levels after this report. But, as of this morning the lake levels are: Beaver – 1128.77, Bull Shoals – 691.80, and Table Rock – 926.26. 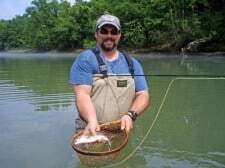 One of the main observations from our guides who were on the water yesterday is the change in our wading areas as well as the rest of the river. We had our suspicions when the water was high because we were seeing gravel in high water in places we had never seen it before. With the water off, we now have holes where there were gravel bars and gravel bars where there were none. Below the MDC boat ramp, the area we always referred to as the “KOA narrows” is now relocated downstream 40-50 feet and is a shallow riffle all the way across the river….maybe ankle deep in some places. If you can get to them, there appears to be more places to wade than before. Some more reports on what was working yesterday morning when the generators were off. Beadhead Hare’s Ear, insect green soft hackle, rockworm caddis green soft hackle, black zebra midge. olive wooly bugger. peach fur bug, and the list goes on. Lots of different folks coming in saying they were “tearing them up” on these various patterns plus the ones listed yesterday. What a day! Friday, generators running, Jim had Price and Marge, from Lawrence, Kansas out for the morning. They always have fun and were catching fish on the red midge, red San Juan, a gray scud and the sculpin bugger. Saturday, the Louisiana Kerrs were on the water again. This time, Stan had Dawn and Albert, and Darrell took James Albert so they could do some streamer work. Another good day for them on the big pink midge, the ruby, and cerise San Juan. 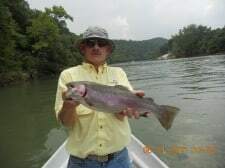 James Albert picked a nice rainbow on a white streamer. Among the many fish they caught, James Albert also caught a nice white bass stripping his streamers. Albert jumped ship and caught this nice rainbow on the high bank as they drifted out. Carolyn was with Dan and his daughter, Alexandria, on the water for half a day. Alexandria is nine years old and this was her first experience at fly fishing. For her first time, she did well getting the line into the water and mending. Once we recognized a strike, she hooked several fish and we finally got a few to the boat. Real trooper and likes to bring in fish. Yeah! Best pattern was the cerise San Juan worm. Jim helped Dale celebrate his birthday on Saturday. They spent the day chasing trout with the sculpin bugger, red San Juan and gray scud. Sounds like Dale has a good birthday. Gina got the benefit of the off generation yesterday morning. 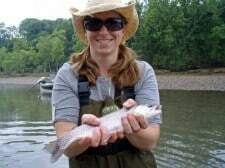 Two new fly fishers, Jeff and Julianna, from Kentucky. They had a wonderful day learning how to cast, catching fish, mending, catching fish, working line, catching fish. Best patterns were the black zebra midge and the size 18 ruby midge. After the water came, on they returned to the shop to learn a little about bugs, knots, leaders, lines, and other gadgets. Both left with a smile on their faces. 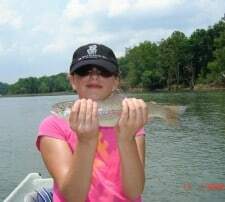 This entry was posted on Monday, June 13th, 2011 at 10:53 am	and is filed under Fishing Reports. You can follow any responses to this entry through the RSS 2.0 feed. You can leave a response, or trackback from your own site.